Fox5 News demo, Feb. 26, 2014. Can I make a confession? I’m not a huge fan of pancakes. It wasn’t always the case. Our father used to make great pancakes every Sunday that he was home while we were growing up. It was one of the domestic things he did really well. He didn’t follow a recipe, maybe that’s why I haven’t been able to make — or find — pancakes as good as his. Or maybe it was just being a kid and loving pancakes then. Anyways, this recipe has change it all for me. They are just amazing — I’ve had them draped in maple syrup, smeared with sour cream, and drizzled with molasses. Whatever you put on them (my husband likes his with hot sauce), these pancakes are so flavorful and have such a nice texture, my love of pancakes is back. If you want to have a little fun with them — who doesn’t? — and you have it on hand, add a few drops of green food color to the batter. It’ll make them look very pistachio-y. Just slightly tweaked from a recipe originated on the blog peanutbutterandpeppers.com. In a small bowl, mix butter and pistachios. In a food processor or medium bowl, combine yogurt, milk, vanilla extract and egg whites. In another bowl mix flour, baking soda, sugar, & salt. Add dry ingredients to liquids and mix, then add pistachios and mix again. Drizzle a non-stick pan with oil or use a cooking spray; heat to medium and pour about 1/4 C batter into pan. Cook until bubbles appear through the top, then flip and cook until done, about 1 minute on each side. Makes 8-10 three-inch pancakes. 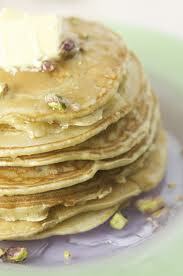 This entry was posted in Brunch, Recipes from Adrienne's pantry, Vegetarian and tagged egg whites, pistachio, yogurt. Bookmark the permalink.